I was given a pair of Realistic speakers with rotted out drivers. However, the carcasses looked to be the basis for a project. I cut the original baffle out (open side in picture). This is now replaced by an MDF side panel. The outer baffle is solid red-oak, bolted to what was the side using a constrained damping layer. The other sides have been treated for damping using vinyl floor tiles (glued and stapled in place) and coated with Soundcoat which is a panel damping compound mixed with regular latex paint. The panel directly behind the woofer is covered with a Deflex sorbothane anti-acoustic reflection panel. The woofer is an carbon Audax HM210C0 8" unit and the tweeter is a Vifa D27TG-35 1" soft dome type. The crossover is a 12dB/octave parallel type using Solen capacitors and Solo copper foil, air core inductors. 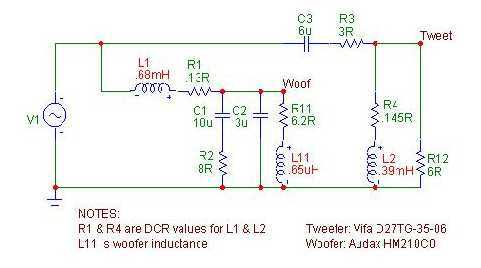 Resistors are Mills and Caddock. The stand is basically a section of 6" PVC cast in concrete into an oak plinth. 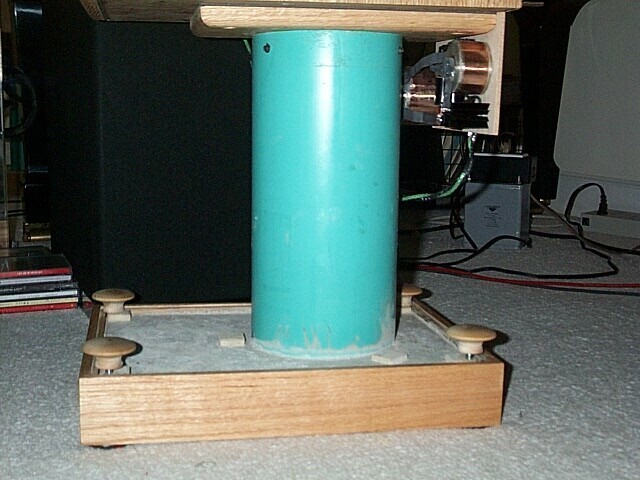 The pipe is located over a 1" thick circle of wood, glued and screwed to the base of the plinth. Three 4" coach bolts extend into the space above the circle and concrete was cast into the pipe over them thus forming an extremely solid connection to the base concrete. The rest of the space in the stand is filled with sand. A very tight fitting 1 1/2" thick circular plug closes the top of the pipe. The plug is secured held in the pipe by radial screws and is glued and screwed to an oak entablature to form a base for the speaker. The entablature is covered with a self-adhesive vinyl tile and in bolted using 1/4" tee nuts onto the speaker. The wooden knobs fitted to the top end of the floor spikes which extend through the plinth. This makes for easy adjustment! For finish, I intend to bring the concrete surface level with a rebate cut in the oak then cover using the linoleum pattern to match the 845 SE. These speakers are still the basis of my system, however I have made a number of changes. The Audax carbon drivers seemed to develop some sibilance and harshness in the upper treble. I concluded that as the cones break in, they also develop break-up modes in the upper treble. So, after a couple of crossover alignment experiments, I ended up reducing the crossover frequency to around 1.5k. Both the low and high pass crossovers are 2nd order. 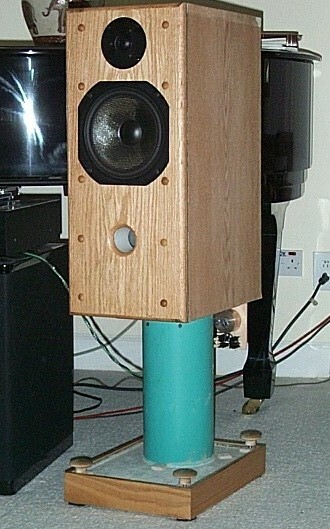 I also found that the speakers sounded best with the tweeters connected in-phase (this is not always the case with 2nd order high pass designs). Additional bracing was incorporated into the cabinets, also a 2nd deflex pad attached to the (underside of) the top of the cabinets. I am still very pleased with these speakers. Though cutting off the carbon drivers at 1.5kHz seem to be a bit of a waste of a 5k driver, I find that the benefit of the carbon cones really shows through in terms of speed. The sound has an immediacy reminiscent of mid range horns.